Glamour shot of the tiny home during the summer. Photo I took when we first visited the property. This tiny gem is completely off-the-grid and runs on solar panels and propane. It is under 250 sq.ft. with a loft for sleeping. There is a separate bathroom equipped with a bucket shower and composting toilet. The lake is super small and has amazing bass fishing. Now all we need is for winter to be over so we can enjoy it! As we all know the housing market in Toronto is out-of-hand! Prices are so high it's virtually impossible to buy a home, unless of course, you inherit a lump sum of money, or a property from a family member. Even if you can save a decent downpayment, your mortgage could take you forty years to pay pay off! Everyone says real estate is the best place to put your money, by Yvan and I weren't willing to be owned by a mortgage for more than half our life, so we needed to come up with another way to break in. The question is - how do millennials and/or xennials begin to even think about owning property, especially property they can actually afford. Yvan and I made it our mission to find a place we could be excited about, enjoy in our semi-youth, and wouldn't put us into crippling debt. Our search began about one year ago. The reality of our scenario is that we are devoted renters of a beautiful apartment in Roncesvalles village in Toronto. We are also very fortunate to be renting from a family member, so our rent is affordable and we don't have to worry about being kicked out of our beloved home. This is a genuine blessing and luxury. So many of our peers and friends have began their lives in apartments they love so much and then with barely any notice they are forced to up-root, begin again and pay double the rent. It's a nightmare out there! With our privileged 'safe renter' situation we have no plans to save a downpayment for a new home in Toronto, for one because everything is way out of our price range, for two because we love where we live. One thing that really excited me about this property was the incredible number of Birch Trees everywhere. I am in love with Birch Trees and our new property has at least forty of them! Yvan and I sitting in front of our new home! We were also totally open to a little ****hole we'd have to tear down or seriously renovate, but after looking for a few months the options were looking quite bleak. First of all... Everything was over $200k, like E V E R Y T H I N G. The only way you got anywhere near that price point was when your search took you up towards Ottawa area or close to Quebec. By the way, if you are able to move an hour outside Ottawa, you can literally buy a mansion on a lake for under $200k! We would occasionally find something, get super excited and then realize it was on leased land or on an island more than 2.5 hours away. So after obsessively looking all summer with little-to-no luck, we were left quite despondent. Yvan was ready to reign it in and wait another year. But, I absolutely love our Ontario autumn, so as one last try I convinced him to drive out to the Kawartha Lake’s one weekend to look at a cute church I found online for $210,000. It didn’t have most of our criteria, but one of my many dreams is to live in a converted church, so I convinced him to go see it. On are way to the church we ended up in the most adorable town called Beaverton, and after our super cute lunch of fish and chips in a funny triangle-shaped building, we stumbled across a real estate agency which happened to be open. We spent some time looking through listings and found a couple listings of vacant land on the Trent Severn River. We began to realize that perhaps our only hope to stay within budget and under 2 hours away, might be to buy a piece of vacant land and then build on it ourselves. We scooped up a couple addresses and ventured into the sun-filled autumn day - it was an adventure and what felt like a treasure hunt! Regardless of not really getting anywhere with our search that day, we had a glorious sunny time in the country, driving around and exploring. We saw some interesting properties but none of them had enough of our check-marks to consider. So on our way home, as it grew dark, we hummed and hawed about the possibilities (or lack there of). By the time we got home we decided that we were going to lower our expectations a little and start looking for vacant land. We remained optimistic by the concept while we yammered back and forth about building our dream A-frame cabin on whatever land we ended up buying. Looking closer we learned the only catch was that it is Off-The-Grid. Which in our minds wasn’t a catch at all but in fact a perk! And the only reason we even found it was because it was listed under VACANT LAND online. If we hadn’t decided vacant land would work for us, we would have never discovered this little gem. It had E V E R Y T H I N G we wanted. Without hesitation we called the listing agent and made an appointment to drive up the next day, on the Sunday of that weekend. Once we were there we fell in love with this property instantly. We put an offer in that same day. All said and done, we now own this adorable slice of heaven, but it definitely was not easy to obtain. We learned some valuable real estate lessons I would like to share with you, so you don’t have to go through the same stressful obstacles that we did. 1 - If you decide you need to break into the real estate market and the property will not be your primary residence, be prepared for some resistance from the bank. Even if you are approved for a mortgage, they may not let you apply it to a property that won’t be your primary residence. 2 - If you want to buy something that (A) is your first property purchase (B) isn’t your primary residence (C) is an off-the-grid property, be prepared to save up the entire dollar amount you plan to offer. 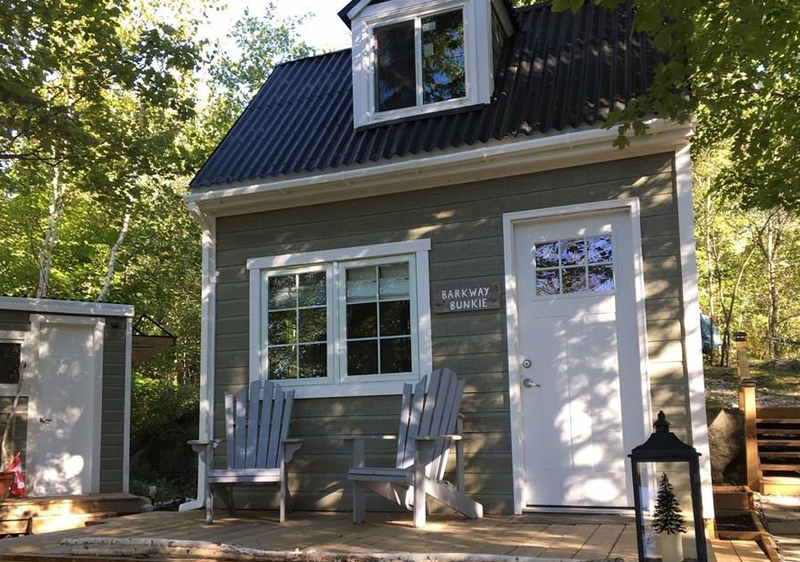 Banks consider off-the-grid properties (especially tiny homes) to be the same as vacant land, and they see little-to-no resale value (even if it’s the most charming little place like the one we found). We feel blessed and so fortunate in how this venture has turned out, but it was full of obstacles along the way. Everything will really sink in once Spring-time arrives, we drive our 1.59 hours and sit on our deck with a bottle of wine. I can’t wait to breathe in that air, get eaten alive by mosquitoes, and feel the ‘freedom feeling’ that a teeny tiny piece of this planet is now truly ours. Oh! And one last amazing thing - The first home I own is almost an identical tiny version of my beloved childhood home in London Ontario. See them side-by-side, the resemblance brings a nostalgic tear to my eye.